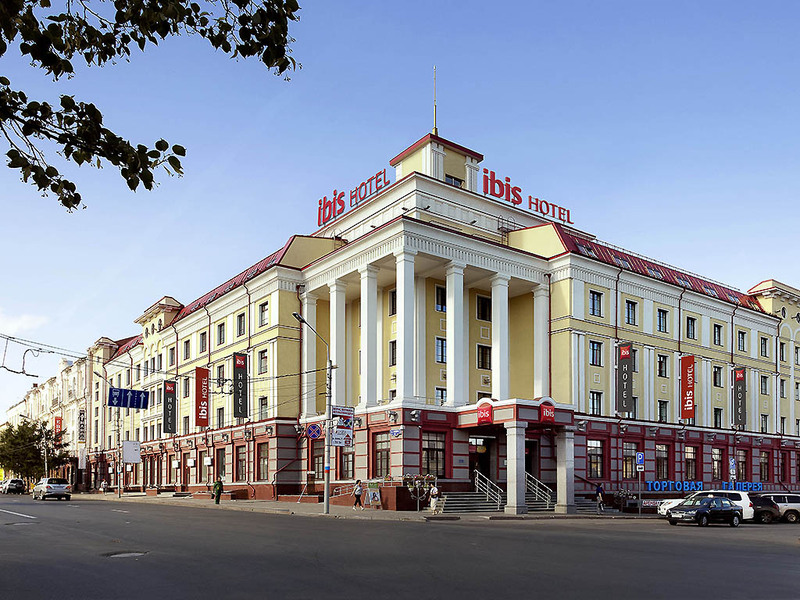 The ibis Sibir hotel is located in the city's main shopping, business and leisure area. It is a 5-minute walk from the Irtysh River in the heart of Omsk, which combines 19th century architecture with modern clothing and jewelry stores. The hotel has 168 soundproofed rooms with air conditioning. The hotel restaurant serves Mediterranean cuisine and the bar is open 24/7. Our 4 conference rooms are ideal for your events. Free WIFI is available throughout the hotel. Our ibis Kitchen restaurant offers a combination of wonderful Mediterranean dishes and traditional Russian dishes. Buffet breakfast from 6.30am to 10am, but there are other options for early risers and those who like to sleep a little later. The price is not reasonable. Breakfast was too optimized. It is easy to find another stand-by hotel for lower price or the same price and better experience. Nevertheless the bed was good as usual. The room was well-cleaned. Well services provided by reception and housekeeping. Clean room, fair internet connection, very polite personnel. I gave an 8 (satisfied) not higher due to the breakfast menu. I am accommodated at the hotel since beginning of November and the menu has never changed. Moreover I will there for another one. Two months with the same cheese, salami, yougurt, omlete, hot dog is too much. Convenient even at 5th floor but too hot unless you open a window for a night. Convenient even at 5th floor but too hot unless you open a window for a night. Otherwise, you just can't sleep. This is formally understood - Siberia and blah-blah-blah, but people come here on business trips to work and have a full rest at nights. I felt extremely uncomfortable during the time in September when air conditioning stopped to work and I felt room was not comfortable to sleep. It is always hot and not the comfortable temperature which can be felt. A nice hotel close to the old city center in Omsk. Walking distance to the Irtysh river (in summer beaches and in winter you may enjoy frozen river). Rooms quite spacious, clean, with refrigerator and the electrical kettle (but neither tea nor coffee available in the room). TV + air-condition. Personnel quite friendly, but hardly speaking English. Breakfast good, but with limited choice of food. Also there is a problem with payment for this, as you need to pay upfront ant the Reception. In general the hotel does not accept “adding to the room” bills. You need to immediately clear your balance. The best part of our stay was the proximity of the Irtysh River with its sandy beaches. The hotel itself is nothing special, with rooms showing signs of ageing, and uninspiring breakfasts. Double-glazed windows, though, are a nice touch, especially on a big football game night; we had no complaints about the sound-proofing. Comfortable stay, fast check in and check out. Noise from the window was a bit too loud & I could not open window at night. Breakfast choice is good though relatively narrow: would be good to have a choice of water based porridge and vegetable margarine for those who follows diet without milk + peanut paste or nutella for toasts would be appreciated. The staff were incredibly cheerful and helpful. The room was beautiful, the bed was comfortable, and the shower was excellent. Thank you. Dear Miss Joan Adele B., We very much appreciate your comments regarding your stay at the ibis Sibir Omsk. It is always a pleasure to receive positive feedback. I will share your comments with our team. I am sure that this feedback will serve as an encouragement to all of our staff as we strive to continuously improve the quality of our services. Thank you again for sharing your experience, and we hope your next visit will be as pleasant as the previous one. Sincerely, Front Office Manager, Mrs.Leyla Kitaeva. Уважаемый Игорь Сергеевич, Благодарим Вас за оставленные комментарии и оценки. Нам особенно приятно получать добрые слова от наших гостей. Всегда рады видеть Вас в нашем отеле! До скорых встреч! С уважением, руководитель отдела приема и размещения, Лейла Китаева. Service, bathroom and general cleanness in the room - good. Breakfast and food in the bar - ok. Laminate in the room, snack in the bar - below expectations. Way too hot in the room with no heating regulation. Had to sleep with open window at -25. The only remark is that it was too hot in my room on the fifth floor. I understand that when the outside temperature is below -25° C, heating the room is essential, but it was too much. All the rest was as good as usual. Thanks. Dear Aleksandr Viktorovich F., We very much appreciate your comments regarding your stay at the ibis Sibir Omsk. It is always a pleasure to receive positive feedback. I will share your comments with our team. I am sure that this feedback will serve as an encouragement to all of our staff as we strive to continuously improve the quality of our services. Thank you again for sharing your experience, and we hope your next visit will be as pleasant as the previous one. Sincerely, Ibis Sibir Omsk. Dear Mohamed Y. Abdelazim E., We very much appreciate your comments regarding your stay at the ibis Sibir Omsk. It is always a pleasure to receive positive feedback. I will share your comments with our team. I am sure that this feedback will serve as an encouragement to all of our staff as we strive to continuously improve the quality of our services. Thank you again for sharing your experience, and we hope your next visit will be as pleasant as the previous one. Sincerely, FOM Mrs. Leyla Kitaeva. The cost of the hotel not in accordance with the quality and quantity of services. The toothbrush for additonal cost. Breakfast is extremly poor. In comparison with other cities, for the same price I can obtain considerably higher rate of service. Dear Dmitry, We very much appreciate your comments regarding your stay at the ibis Sibir Omsk. It is always a pleasure to receive a feedback. I will share your comments with our team. I am sure that this feedback will serve as an encouragement to all of our staff as we strive to continuously improve the quality of our services. Thank you again for sharing your experience, and we hope to see you in our hotel again. Sincerely, Front Office Manager, Leyla Kitaeva. This hotel is in the very center of Omsk. It is historical building which can explain the size of rooms which are larger that common Ibis ones. Breakfast is the same as in the others Ibis hotels. Light is poor as in all Ibis hotels. Dear , We very much appreciate your comments regarding your stay at the ibis Sibir Omsk. It is always a pleasure to receive positive feedback. I will share your comments with our team. I am sure that this feedback will serve as an encouragement to all of our staff as we strive to continuously improve the quality of our services. Thank you again for sharing your experience, and we hope your next visit will be as pleasant as the previous one. Sincerely, Front Office Manager, Leyla Kitaeva.